Easy Gingerbread Cookie Recipe - Molasses Gingerbread Cookies! 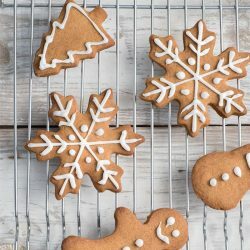 December is here and pumpkin spice has been pushed back farther in the cabinet to make way for gingerbread spices and the ingredients to make our favorite Christmas and holiday sweets and cookies. 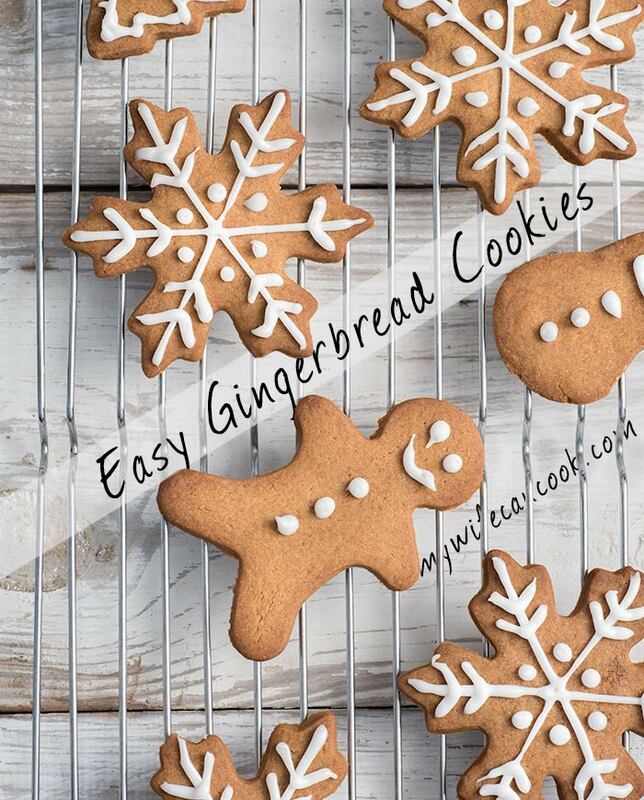 This is an easy gingerbread cookie recipe adapted from a cookie passed down from my grandmother. I think it originally was maybe a molasses shortbread recipe (no eggs), but we have always used it as one of our favorite roll out cookies at Christmas. I’m sure it could be used to make shortbread cookies similar to our shortbread recipe. We generally make the gingerbread molasses shortbread recipe into gingerbread men and women (because this was what my family did when I was a kid), but I frequently make it into reindeer with red noses. And my kids like trying out all the cookie cutters. I think the snowflake shape was most popular this year. 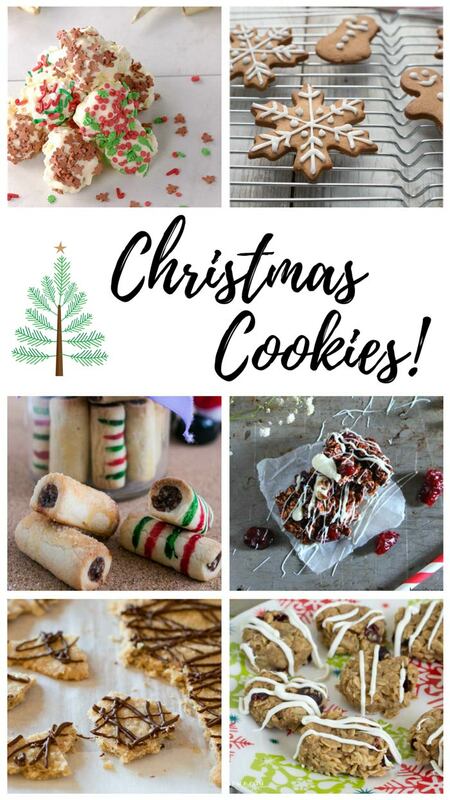 We’ve teamed up with some other talented bloggers to collaborate on a list of fun Christmas goodies. 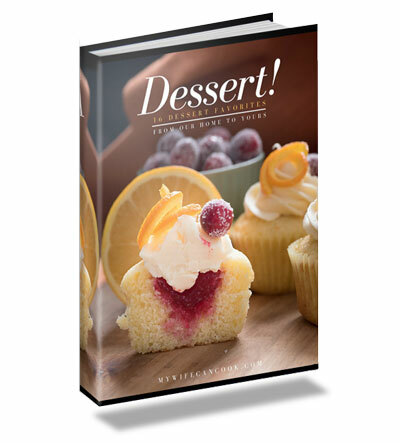 See the list at the bottom of our post for the links to these other delicious treats! 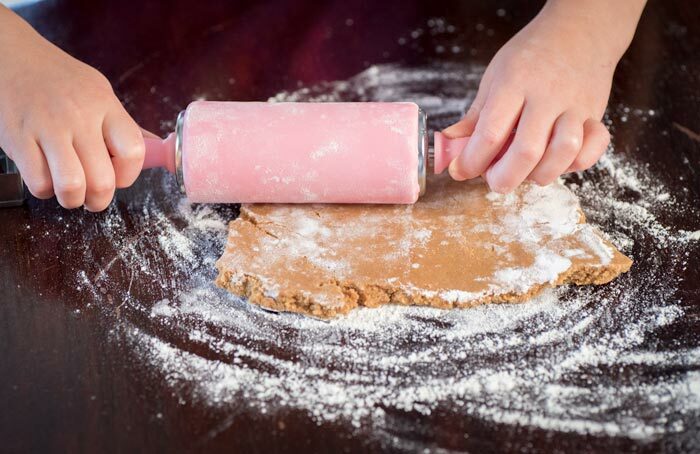 This is the first year we made this easy gingerbread cookie recipe when my kids actually helped roll out, cut, and decorate our cookies. I’m not going to lie, it got a little crazy (and messy). However, I think we all enjoyed it. Since this gingerbread cookie recipe contains no eggs and I used a vegan alternative recipe for the royal icing, it was a kid-friendly cooking activity. You try telling kids not to eat the dough because it has raw eggs. And really, who am I kidding? They learned to eat the cookie dough from watching me. Now that I know it can be done, cookie making and decorating will go on the yearly Christmas activity list! Plus, I figured out a few ways to make it go smoother. The dough needs to be made 1-2 hours ahead and chilled. You can also make it several days ahead of time. Or make the cookies and freeze them to thaw and decorate closer to Christmas. I think it’s really all about finding what works for you, figuring out some time saving or sanity saving tips, and then just “rolling” with it. 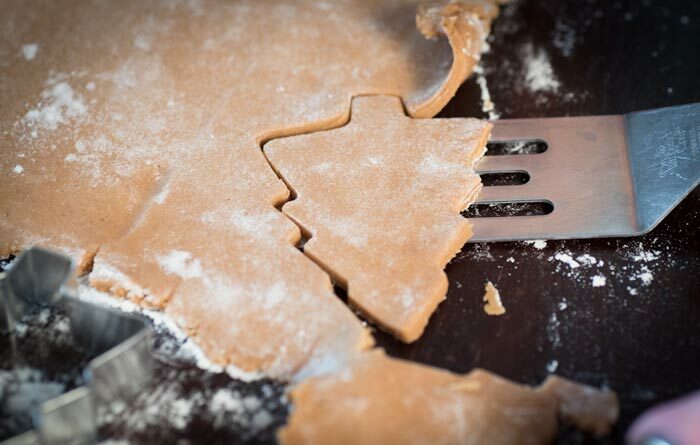 If you are looking for more technical tips, King Arthur flour has a great cookie decorating resource page. Mix in spices and baking soda. Mix in flour in small amounts and slowly until mixed in. Dump out on counter, form into 2-3 portions and flatten into square shapes, maybe an inch thick. Wrap tightly (I wrapped in wax paper and placed inside a ziploc bag) and chill for 1-2 hours and up to a week in the refrigerator. Roll out dough evenly to about 1/8-1/4" thick. Using a cookie cutter, cut out cookies, and place on cookie sheets. Cook for 12-15 minutes depending on size and thickness of cookies. Place sifted sugar in mixing bowl. Whisk corn syrup and 1 T. milk together. Add syrup/milk mixture and slowly turn on mixer. 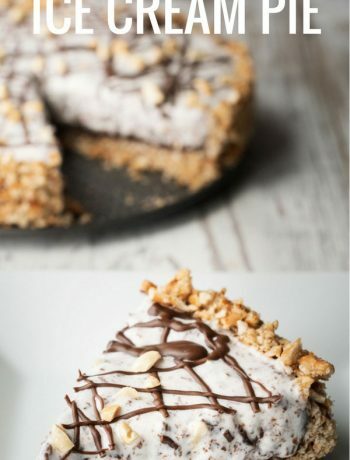 Add additional milk 1/2-1 T. at a time until desired consistency of icing--should drizzle and retain shape if you are using for outlining or drawing lines/dots. 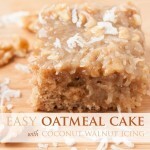 If you are using for flooding icing, add milk until it doesn't retain shape when drizzled, but not super runny. 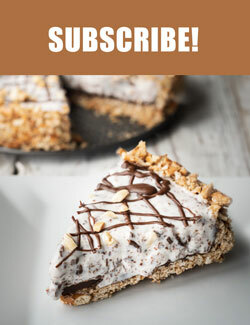 Place icing in a pastry bag or ziploc bag and decorate! 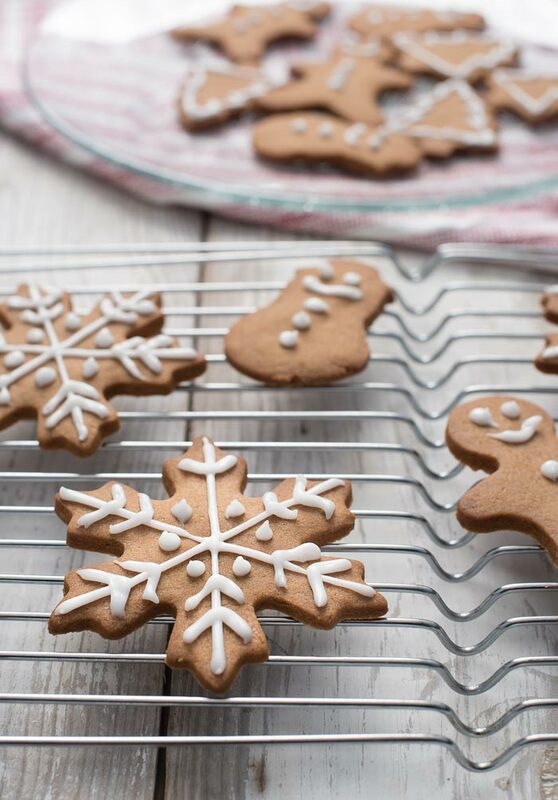 I happen to LOVE gingerbread…and could eat it all year long. These are really cute and would also make great tree decorations….put then people would eat your decorations. Yes, I love it. We used to make hearts at Valentine’s with it and maybe even Easter eggs. Who says you can’t have gingerbread any time of year? Thank you! They are one of my favorites! Your cookies look beautiful Melissa! 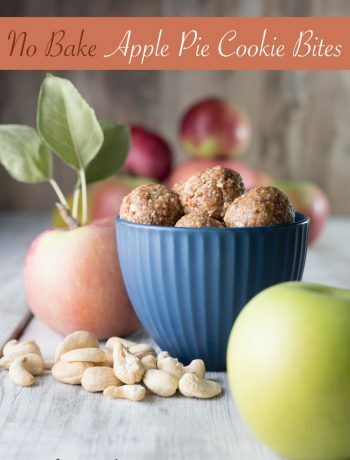 I love that they’re made without eggs, too, my kids would love them! Thanks! My kids highly recommend them! Oh… is there anything more Christmas-y than GINGERBREAD?! 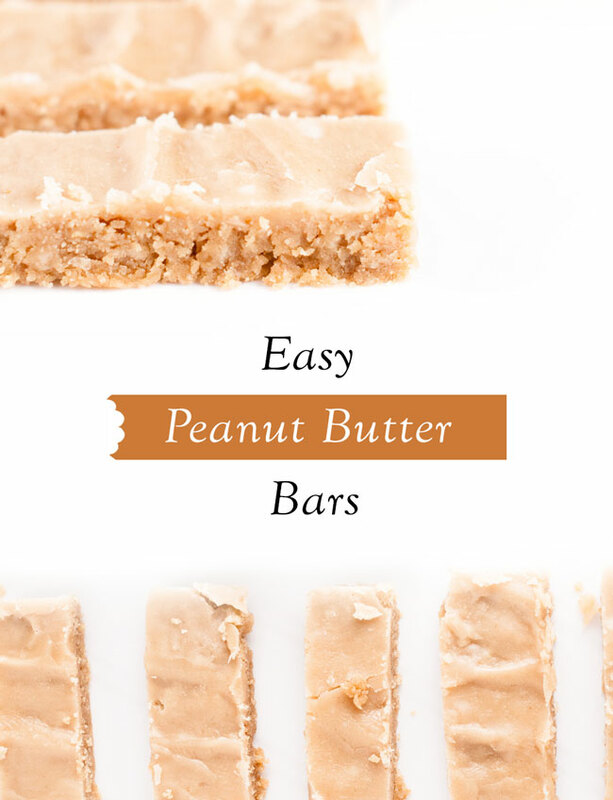 Nup… these look absolutely beautiful and love your tips for working with kids. Such a great experience for them that can quickly turn into something a little challenging for those in charge! Thanks. Yes, gingerbread at Christmas is a must for me! It took a few years to figure out how to make it work with the kids, but it is definitely a tradition I want to keep. I love all the times you added with your recipe. Gingerbred cookies are one of my favorite Christmas cookie to bake. I love it and has fun to pass on my family’s tradition! Thanks! My kids literally ate them in 48 hours and we will be making more. Do you think I could make this in a blender? I have a cookie dough blade! I don’t really know, I’ve never made cookie dough in a blender. If it has a cookie dough blade, I’m guessing it would work? I usually mix by hand, but it does get a little difficult at the end.